Facebook will tweak the user profile sometime tonight to let users fine tune the news items delivered to them on their home page. 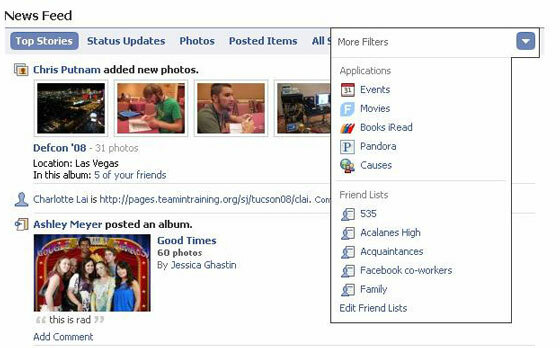 Currently users can filter news items to see top items, status updates, new photos and posted items from friends. With the changes, users can opt to see application-specific news items (events, movies, Causes, etc.) or just see all news items without any filtering at all. Specific friends or friend groups can also be selected. The importance of the news feed as a fresh content engine that brings users back over and over again each day isn’t lost on Facebook . They were the first major service to popularize the idea of a stream of news about a person, and haven’t been afraid to borrow good ideas along the way to make the product more compelling. Now if we could just get a RSS feed of all those streams out of Facebook, they’d cement themselves as the permanent hub of all that data.